Recently, we posted on a Daily Mirror article about the Munich Massacre which astonishingly referred to the murdered Israeli athletes as “terrorists”. Editors quickly corrected the error after we tweeted the journalist responsible for the mistake. 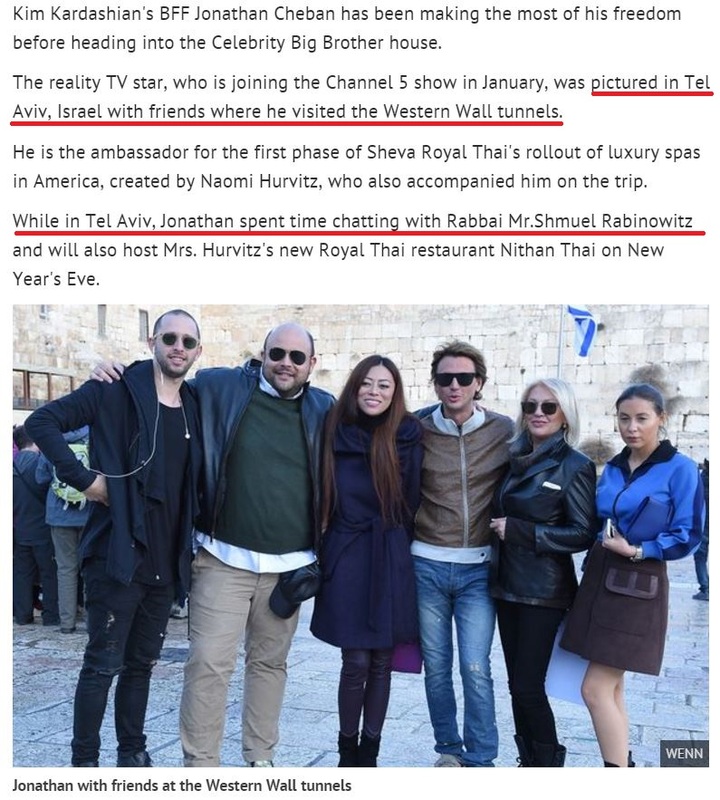 Today, we found another curious error at the British tabloid in a celebrity article, published on Dec. 31, about a recent visit to Israel by reality TV star Jonathan Cheban. The Western Wall, part of the retaining wall of the Temple Mount complex, is of course in Jerusalem. Additionally, Rabbai [sic] Shmuel Rabinowitz is the chief rabbi of the Western Wall and holy sites, and their meeting occurred in Jerusalem as well, not in Tel Aviv. We’ve tweeted the journalist responsible for the error in hopes that place the Jewish holy site back safely in Israel’s capital. UPDATE: The Daily Mirror journalist responded to our tweet and corrected the error. That is the disgusted level of Western journalism today, specially the British bigots. I see no ‘journalism’, only morons. And in this case I think it’s less bigotry and more utter stupidity, ignorance and the curious idea that any dumb pillock can be a ‘journalist’. Oh Adam, Adam, Adam, this really must be a slow news day. I did hear that a man bit a dog. Why did the man bite you? So you are not interested in reporting facts by knowledgeable reporters but ignorant assholes whose basic knowledge of the place they are supposed to report on is zero. Natural and logical, everybody here understands your frustration. But venting this frustrations here is much better than becoming a news item after poisoning the neighbor’s cat or biting his dog. So keep it up posting here for the sake of these poor creatures. Jerusalem is not “Israel’s capital”. Its status remains a matter of DISPUTE – and like all contentious matters, should be properly acknowledged and signaled as such to your readers. As an analyst/critic of journalistic standards, you really ought to know this, Adam, so hopefully, you’ll be posting an amendment very soon…. Miranda are you feeling enough superior morally to tell us lowly Israelis what should be our capital? Have you ever occurred to you that nobody gives a whatever about your absolutely irrelevant opinion regarding this subject? Now let me inform you – Jerusalem is Israel’s capital simply because the Israeli public decided so. Period. If you don’t like the fact come here with a knife or an explosive belt and try to do something against it. But the world press has no qualms or reservations in referring to Raqqa as ISIS’s capital – and yet ISIS members have no millennial-long connection to that city, nor was Raqqa ever formally recognized by the international community as being within their “historical homeland” nor were the members of ISIS ever granted the right – again by the international community – to closely settle there with the goal of exercising their rights of self-determination. That’s some glaring double standard, wouldn’t you say? Miranda which other country’s capital are you in charge of declaring? “Jerusalem is not “Israel’s capital”” – it is factually Israel’s capital, just as water is made up of hydrogen and oxygen, and just as the Nile is a river and not a vegetable. It is certainly indisputable that you are a moron.